IE Nominated for FMBE Awards 2016! We’ve been nominated for not one, not two, but three FMBE (Field Marketing and Brand Experience) Awards 2016! The nods come as a result of our Road Respect #SpotRoadi summer campaign where we incorporated Oculus Rift in with road safety for the NSRI Road Safety Partnership in the North East, as well as our Canny Taxi activation where we offered free taxi rides to the late night revellers of Newcastle. For #SpotRoadi we toured around the 6 partnership areas over the summer on a 42 consecutive day promotional campaign with a brand new bespoke Road Respect promotional van named Roadi by the public. The experience featured real areas and landmarks of the North East such as The Angel of The North, The Tyne Bridge and The Tyne Tunnel with users getting high scores for driving safely. Scores were then shared via email and the Road Respect social media channels, with an online leader board being integrated into the Road Respect website. Our CannyTaxi activation was rolled out around Christmas, with free taxi rides “hyem” or “oot” offered to the Geordie public by our fantastically branded Road Respect Canny Taxi as a way of thanking the public for leaving their car at home when out on the drink. Our promotional models were at hand to ask road safety questions and query whether or not passengers had any experience with drink driving in the past, and footage was filmed inside of the taxi using GoPro technology, with a fantastic response but at the live events and online on social media afterwards. The awards have been established through 12 years as the leader in championing field, retail and live experiential marketing. The night is the industry networking party of the year attracting the biggest and best brands and agencies. 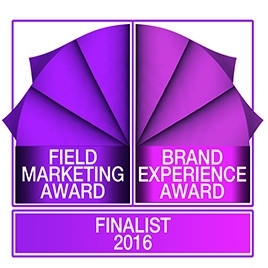 The Field Marketing and Brand Experience awards 2016 will be held at the Troxy, London for the third year running. This year award’s night will be October 20th and we can’t wait!